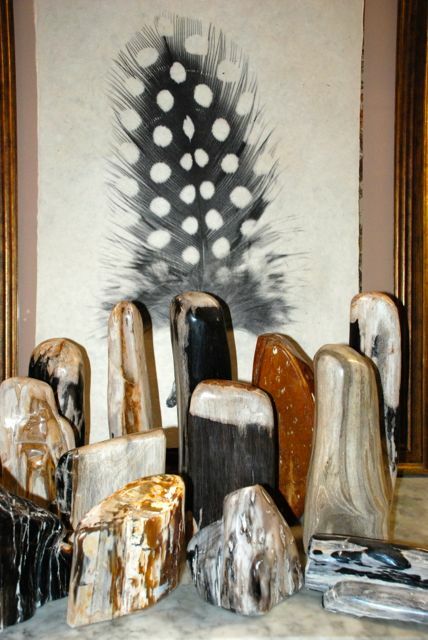 For the person who is looking for that unusual gift this season these small pieces of petrified wood are just the thing. They range in price from $18.00 to $48.00. Rich in color they would look great on a bookshelf or desk. In the background is a handmade paper print of a feather signed by the photographer. We have 4 different feather designs. They are 30″ by 20″ and come with unique magnet holders so no picture frame is required. Wooden Type Letters Chinoiserie Jewelry Cases on Sale!